The Agua Caliente solar farm near Yuma features First Solar’s thin-film cadmium-telluride (CdTe) solar modules. 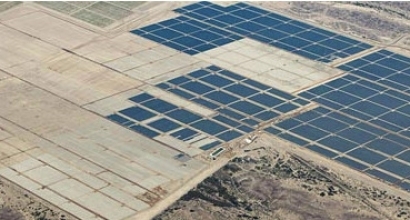 Located 65 miles east of the city of Yuma, Arizona, this plant is one of the world’s largest operational PV power plants with 290MW (AC) connected to the electricity grid. All of the power generated is sold to Pacific Gas & Electric Company under a 25-year Power Purchase Agreement. The project is the first commercial-scale photovoltaic plant to use new inverter technologies that make the plant more reliable and allow operation during larger voltage variations than traditional inverters. These variations can be caused by cloud cover or dust that causes voltage spikes or drops. Use of this technology also will improve the delivery of clean electricity generated by photovoltaic systems to the utility grid. Increasing grid reliability will enable greater deployment of large-scale photovoltaic renewable power generation projects. The Agua Caliente project used approximately 39,000 metric tons of American steel, will generate 559,000 MWh of renewable energy annually, and will avoid nearly 330,000 metric tons of carbon dioxide each year, equivalent to the emissions of almost 70,000 vehicles.